IMAGE: Athletes from Belarus take part in the opening ceremony. Photograph: Sergio Moraes/Reuters. 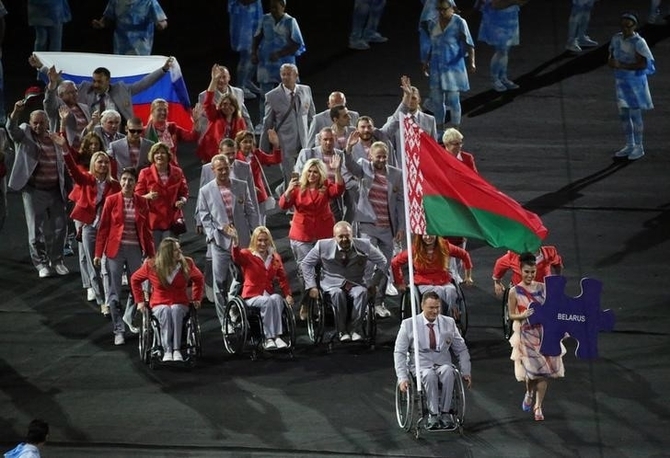 The Belarus team carried Russia's flag as well as their own at the Paralympic Games opening ceremony, in a show of support for their near-neighbours, who were banned from the competition in Rio de Janeiro. The head of the Russian Paralympic Committee (RPC) Vladimir Lukin told the TASS news agency that he was grateful for the gesture at the ceremony on Wednesday night. "I can only thank our colleague from Belarus," Lukin said. Russia were excluded from the event by the International Paralympic Committee (IPC) because of a state-sponsored sports doping programme. "During this difficult period, he remembered about us, thought about fairness and that politics should not be part of sporting competitions...It's great that the Belarusians thought about the closest country to them, about Russia. We won't forget this," Lukin said. According to Russian media, the person who carried the Russian flag was Andrei Fomochkin, the director of the Republican Centre of Olympic training for Athletics in Belarus. The Russian Foreign Ministry's spokeswoman Maria Zakharova said Fomochkin was a hero. "A hero has appeared today amongst us. This is the person who unveiled a Russian flag in honour of the Russian Paralympic team and showed solidarity with people who were disgracefully treated in an inhumane way in not be allowed to compete at the Paralympics," Zakharova told Interfax news agency. "We are proud that such people exist and people like this are above politics," she added. The Belarus Foreign Ministry also commended Fomochkin. "This was the right thing. Our sportsman acted in a serious, manly and friendly way. If we need to answer for these gestures, then we will answer," the Ministry's press secretary Dmitri Mironchik told RIA Novosti. Gymnast Dipa Karmakar, brand ambassador of India?